If you ever have doubts about how much American soccer has grown and matured in recent decades, perhaps what is needed is a demonstration of this growth, which isn’t always clearly visible. This is easily arranged. All that is required is for you to become aware of the Dettmar Cramer episode. Events that spark firestorms of on-line criticism of American soccer officials today seem laughably mild compared to the comedy of errors that happened just over 40 years ago. In January 1975, the U.S. Soccer Federation was forced to watch the U.S. national team coach walk away to another coaching job, and was unable to do anything about it, because it had neglected to ever have him sign a contract. Can you imagine the meltdown that would take place on the Internet after an event like that today? The fact that such an event is unthinkable in 2015 is an indication of how much things have changed in 40 years. Somewhat surprisingly from the perspective of 2015, there was no ring of shock waves affecting American soccer in the wake of this event. There is no record of fans screaming for anyone’s head. It was nothing like it would be today. This episode started on July 27, 1974 when Jimmy McGuire, the president of the USSF, announced that Dettmar Cramer (who died recently at the age of 90) had been hired as coach of the U.S. national team. This was a eye-opening coup for American soccer. 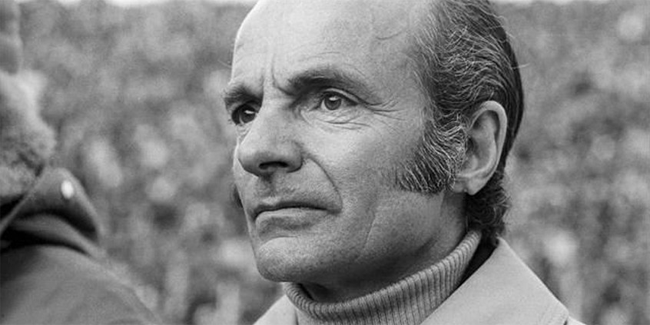 Cramer, who was 49, had been an important figure in German soccer for years, and had just served as an assistant coach of the West German national team as it won the 1974 World Cup. He had never been the head coach of a top-level European club, but even so, when American fans have clamored over the years for the USSF to hire a European experienced in the international game to coach the U.S. national team, the sort of man they have been talking about is somebody exactly like Dettmar Cramer. In addition to his years of coaching in West Germany, Cramer also had successful experience at leading the national team of a developing soccer country, Japan. Cramer, who was to be paid $100,000 a year, only coached the U.S. national team in two full internationals, both friendlies against Mexico in September 1974. In December of that year, he took an American team for a series of games in Israel, but shortly before that trip, he had received an offer to become coach of Bayern Munich in the West German Bundesliga. By the time the Israeli trip ended, Bayern’s offer had become public knowledge and Cramer had decided to accept it, which he did on Jan. 19, 1975. The USSF threatened to sue him for $10 million for breach of contract. It was at this point that it was revealed that there was no contract and never had been. Could there have been some connection between Cramer’s sudden departure and the fact that the USSF president who hired him had died unexpectedly two months before? It seems possible. Cramer was only at Bayern for two seasons, but they were good ones. He led the Munich team to victories in the European Champions Cup in both 1975 and 1976. His brief tenure at the USSF, and its sudden end, did have some good effects there. His departure highlighted the need for tightened administrative procedures, and he laid the groundwork for an improved system of player development, to the eventual benefit of U.S. national teams. He is very positively remembered by the American coaches he taught at the coaching schools he established here. About five months after Cramer departed from the United States, Pele arrived to play for the New York Cosmos, starting a new era in American soccer. You can bet your bottom dollar that the Cosmos made sure that they got Pele’s signature on a contract. A version of this article was originally posted on the BigSoccer.com website in August 2011. It owes a debt to several sources, particularly the 1983 book U.S. Soccer vs. the World, by Tony Cirino, who was the sports editor of Il Progresso, an Italian-language newspaper in New York. The article is inaccurate insofar as it states that Cramer had anything to do with Germany’s World Cup win of 1974. At the 1974 WC he participated as member of the FIFA technical committee. Cramer exited from the coaching staff of Germany some time in the aftermath of the World cup 1966, when disagreements with regards to tactics applied by manager Schön came to the fore. Some say, that Cramer had always thought that he should have been given the manager job instead of Schön in the first place. Cramer remained with the association, but served as German coach for the global development of the game holding many overseas postings. Between 1971 and at least march 1974 he was manager of Egypt, taking them to the third place in the Africa Cup. Already in January 1974 he had signed a a three year contract with German first division side Hertha of Berlin. He exited after the first training session on July 9. He gave as reason unfulfilled transfer requests, Elsewhere it says that he withdrew for “personal reasons”.Others say, that he would not want to co-operate with Hertha club-manager Holst, whom he deemed corrupt, arguably rightly so. Now you tell me, he was supposed to be paid US-$ 100K (then 260K Deutschmarks) per year from the US association. I know that in 1977 Hertha hired manager Kuno Klötzer from Hamburg, where he just had won the European Cup Winners’ Cup, for 7000 Marks per month (then ca. US-$3K, if you will, generously, albeit rather unrealistically double up with premiums for wins). Threfore, methinks, might it not have been that Cramer and the US-soccer president happen to meet at the World Cup or something like that, and Cramer started to regret his signature from January? What remuneration is concerned: the above article says something of US-$ 55K (which does not have to mean much). German sources say, the man who was hired by Hertha in his place, Georg Kessler, was hired on the basis of 150K Deutschmarks, (57K USD then) which was supposed to be less than what Cramer was to get.